When you think of Washington State, coffee, rain and salmon immediately come to mind. But there are cowboys, real working cowboys, and a lot of western history, in eastern Washington State. Easy to get to and fun to drive, the Highland Historical Loop Drive provides scenery, history and attractions all rolled up into a fun-filled experience for young and old. 110 miles south of the Canadian border, Spokane is the largest city between Seattle and Minneapolis. With a population of just under 200,000, Spokane has small town charm and community spirit with all the latest modern big city conveniences. Ten to twelve years ago, Spokane was a dying city. But thanks to a strong community spirit and over $1 billion spent in renovating the historical downtown and river front areas, Spokane is now a clean, modern and exciting tourist destination. 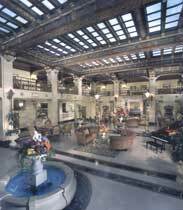 An absolute must-see while in Spokane is the Davenport Hotel, truly the crown jewel of Spokane. Opened in 1914 and completely renovated from 2000 through 2002 at a cost of over $36 million, the hotel recalls the style and grace of the gilded era of the early 20th century. The first hotel where Crab Louie was served, the first with air conditioning and the first with a central vacuum, today, as a AAA Four Diamond hotel, it is the highest rated property in Spokane. Even if you don’t plan to stay in the Davenport, take a walk through and relive history. It’s an incredible tour back in time. On the northern edge of downtown is Riverfront Park with the largest urban waterfalls in America. Originally the railroad yards that helped build Spokane, the 100 acres of park were developed during the 1974 World’s Fair. With the beautiful Spokane River rushing through the middle, it’s the center of Spokane concerts, festivals and celebrations. Take a train tour, watch live theater, ride the 1909 hand carved Looff Carousel or take the gondola ride high above Spokane Falls. Want to easily see wildlife and nature at her best alongside a flowing river? The Centennial Trail is a 37-mile dedicated path for biking and walking that stretches from Riverfront Park to Coeur d’ Alene, Idaho. Most of it is paved and follows old railroad routes with little or no grade, so riding is easy. The route also bypasses all roads and highways so it’s safe for riders, walkers or joggers of all ages. Ever feel like hand-feeding a live lion or tiger? About 15 miles north of Spokane is Cat Tales, a zoological park and animal handler training center. The park is home to big cats including lions, tigers, leopards, jaguars, servals, caracals and pumas only 8 feet away from you in their cages. Cat Tales is dedicated to educating the public about the big cats while insuring their survival. Want to go to heaven? Walter’s Ranch in Green Bluff almost fills the bill. In the rolling hills northeast of Spokane, Walter’s has orchards of naturally ripening apples, peaches and cherries. Take a ride on the “Fruit Loop Express” into the orchard to pick tree-ripened fruit or learn how to plant or trim a fruit tree. The log cabin store is filled with jams, jellies, fruit, cider, cinnamon rolls and fresh baked pies. Plan your arrivals during strawberry, cherry, peach or apple festival time. Fun for the whole family. How about some wine tasting? The Townshend Cellars is a favorite stop for locals and tourists alike. With their small and intimate tasting room, you’ll be able to sample a wide range of red and white wines as well as unusual varieties. Try something really wild—a unique Huckleberry Port. The winemaker, Don Townshend, will be happy to ship your selection of wines anywhere you like. Leaving Spokane northbound on highway 395 (best time is morning), head north passing Loon Lake, Chewalah and Colville. At Kettle Falls you’ll cross the mighty Columbia River, turn south onto Route 20 and begin climbing up to cross Sherman Pass at 5,587 feet. Dropping down into the town of Republic between the two highest passes in Washington, you’ll find breathtaking views, cool rivers and lots of history. This trip of about 125 miles to Republic will take about 3 hours. The Highland Historic Loop Drive runs north from Republic through small historic towns and places to Oroville, across the lake from Osoyoos, the Palm Springs of Canada. It then turns south through Tonasket and back to Republic. The total distance is about 157 miles. Although it can be driven in one day, it’s best to stop for a night in Republic and one night near Oroville to split up the drive. Better still is to plan the trip over at least one full week to better partake of all the route has to offer. Once known as Eureka, Republic was a wild and wooly gold rush town. Today, Republic offers hunting, fishing, hiking, bird watching and the Ferry County Fair. With quaint shops, saloons and great restaurants, Republic has an ongoing array of activities including Prospector Days, Family Rodeo, Birding Festival, Open Fiddle Contest, Barrel Derby Days and Rough Club Golf. Want to be a real cowboy? Now you can ride the range with the best of them as a real cowboy on a real operating ranch. 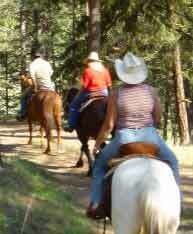 The K-Diamond-K Guest Ranch caters to “city slickers” from age 12 and above. This is a family ranch and you’ll be one of the hands, rounding up cattle, feeding horses, eating family barbeque and sitting around a campfire singing cowboy songs. Steve and June Konz built the ranch and raised their family here. June’s a veterinarian and may just invite you out for a calving or to treat an ailing cow. You can fish, hike, bird watch and stargaze to your heart’s content. But plan on staying at least three days or more to get the full effect… There’s just too much relaxin’ to get done. Want to ride a 100-year-old horse? 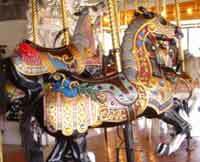 At the fairgrounds you can ride on their 100 year old hand-carved carousel. From 1992 until 2002, the carousel was restored in an ongoing community project that involved families, relatives and friends from all over. From construction companies donating buildings to children baking cookies, everyone helped to save the aging ride. The end result is a beautifully restored 1900 carousel the town proudly operates to the delight of children of all ages. Care to open some ancient history? The Stonerose Eocene Fossil Site on the edge of town where you can actually unearth your own fossils. Once the bottom of an ancient lake some 50 million years ago, todays shale layers can be split like the pages of a book to reveal leaves, fish, insects and twigs frozen in time. 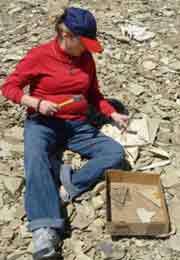 You get a hammer, chisel, bag and directions on how to find your own fossilized treasures. Best of all, they guarantee no one will leave without finding a real fossil. Heading north out of Republic on Highway 21, you’ll drive past picturesque Curlew Lake where you can stop to fish. Passing Malo, take a look at the historic Malo Store that was built in 1903 and is still operating today. Continuing up the Kettle River you’ll enter Curlew. 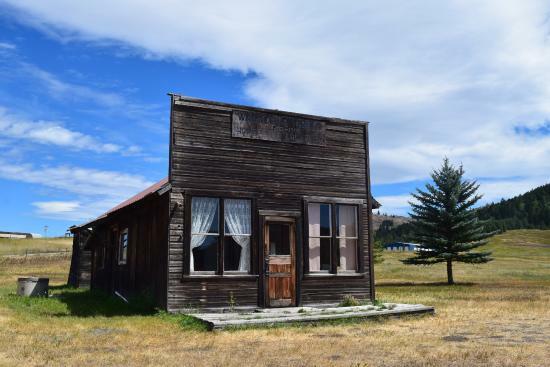 Once a bustling town on a main stop of the Great Northern Railroad, the town withered when the railroad ceased operations there. It’s still a good place to get a bite to eat, walk through town and stretch your legs. Want to travel back in time? Stop and tour the Ansorge Hotel Museum—built in 1903, it’s like entering a time warp. Most of the original furniture, dishes, clothing and pictures stand as ready for customers as back then. Folks still sit in the lobby talking about old times. You can even get a ride around town in a Ford Model-T parked just outside. Leaving Curlew head south to find County Road 50 (West Kettle River Road) to Toroda. You’ll be following the Old Boulder Creek Trail weaving its way through mountain passes and valleys. At Toroda, turn left onto the Toroda Creek Road (County Road 502). Just before Bodie turn right onto Chesaw Road (County Road 9480) and follow it to Chesaw. Chesaw has only a few remaining buildings including a store and a bar. In the bar, joins hundreds of other travelers by stapling a $1 bill with your name written on it to the ceiling or wall. The bar is literally papered in one dollar bills. Snacks are available in the town store. Continuing along Chesaw Road to the west, look for the Hee Hee Stone Indian Legend marker. Hee Hee, a Native American girl, fell in love with a white man. Because this was absolutely forbidden, Hee Hee was stoned to death. A pile of stones seen above the road on the right is said to mark the place where she died. Shortly after the Hee Hee marker, look for Molson Road on your right. Driving up the valley you’ll probably see deer and other animals over the wide expanse. Soon you’ll arrive at the Molson Ghost Town Museum on your right. The town of Molson was a gold boom town in the 1800’s until mining fell off in the 1890’s. The area was opened to homsteading in 1900. The Museum is actually one of three Molson towns. Buildings from the original town (Molson 1) were moved because of land disputes to this location to preserve them as a ghost town (Molson 2). After seeing the ghost town, continue up the road to the current town (Molson 3). Here you’ll find the old Molson Schoolhouse Museum. Built in 1914 and in use until 1969, the three story brick building houses a large collection of historical items from around the Molson area. At this point it’s been a long day and a great place to spend the night is the Eden Valley Guest Ranch. With deluxe cabins on a high plain with rivers, streams and wildlife all around, it’s a wonderful place to rest up for the return drive. To get there, go back down Molson Road to Chesaw Road and turn left (back the way you came) until you find Dry Gulch Road on your right. Follow Dry Gulch Road a short distance until you find Eden Valley Lane, turn right and follow it to the guest ranch. The owners, Pat and Robin Slice, will make sure you have a wonderful country evening. Continuing on about ten miles from Eden Valley Guest Ranch and Molson along Chesaw Road you’ll come into Oroville. With a population of around 2,000 full time residents, Oroville sits on the south end of Lake Osoyoos along the Pacific Northwest Trail. The lake plays host to the annual Can-Am Apple Cup Limited Hydroplane Races in mid-June and with festivals, rallies, farmers markets and rodeos, Oroville is an exciting place all summer long. Heading south out of Oroville on Highway 97 you’ll see Ellisford and it’s Old Okanogan Mission Monument. In Tonasket you’ll find antique shops, dining and a farmers market every Thursday. It’s also the home of GarlicFest at the end of July. Filaree Farm, located 2 miles outside of Okanogan, has collected over 140 different strains of garlic from around the world selling seed stock to gardeners and farmers everywhere. In Tonasket, take Highway 20 back to Republic. This scenic highway route is about 45 miles and takes a little over one hour to drive. Once you get to Republic and feel like stretching your legs, take a look at the Perry Wilderness Park in town. Right next to City Hall, the walk wanders along both sides of Granite Creek in the cool quiet of the woods. Even this close to town you’ll be able to spot deer, squirrels, rabbits and many beautiful birds. If you happened to get off to a slow start in Eden Valley or you just don’t feel like taking that final 3 hour drive back to Spokane, check into the Prospector Inn Hotel for the night. Then you can wander the streets and shops, grab a bite at the Hitch'in Post Restaurant & Lounge and dance the night away at Madonna's Bar and Grill, the only “swingin’ door bar” in town. It’s a great way to celebrate small (western) town America. All good things must end so now you’ll head back down Highway 20 to Highway 395 on to Spokane. The three hour drive will seem a bit longer as you remember all the wonderful sights and sounds you experienced in this part of Washington State. But remember, these are not just one-time destinations; the many festivals, celebrations, markets and the wonderful people make it a place to be revisited again and again.